How often have you kissed your child, grandchild, spouse or even your cat or dog as they slept? Sometimes kissing is a tender, poignant act wordlessly conveying unbounded love — even though the recipient doesn’t even realize that he/she is being kissed. The above photo of my mother kissing my nephew as he slept in her arms perfectly demonstrates the point. He is now a 17-year-old high school senior and she is gone. 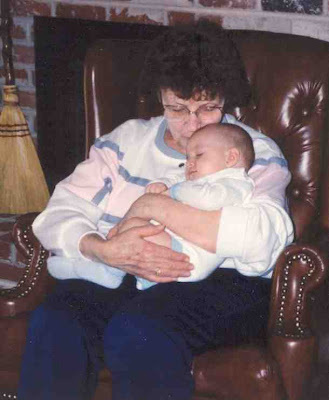 The picture, illustrating a grandmother’s love for her grandchild in a way no words ever could, is, at this juncture, literally priceless and irreplaceable. The moment is gone forever, but remembered by the photographer (me), and brings comfort to those who remain. This post is lovely and poignant–it makes me think of the times when my children were babies and I would just nuzzle their little heads. And this line was my favorite: “The picture, illustrating a grandmother’s love for her grandchild in a way no words ever could, is, at this juncture, literally priceless and irreplaceable.” So true! Thank you for your comment on my blog–much appreciated! Also, upon “walking in your door” here, I read your profile and saw that we like many of the same TV shows, books, and movies. I’m loving Top Chef this season and can’t wait to see who wins the whole thing. It is wonderful that you have this picture… and those memories. Just lovely- thank you for sharing this. I love the way you wrote this piece. You really write very well. I felt how much you love your mother. This is indeed a treasured memory. Thanks for sharing. ohhh..that photo is precious (and yes, priceless!). What a tender illustration of a loving kiss. That photo – and the sentiment expressed within – is such a cherished keepsake. Lovely post! Wonderful photo and beautiful post to go with it. Great choice for the hunt! Those almost automatic kisses on a baby’s head as you hold them were the first kisses I thought of when I read the prompt. Wonderful that you have this photograph. Thanks for sharing it. Such a sweet photo, and a sweet memory. Makes me wish my mother had been here to kiss my son while he slept. Quiet and tender image…even more bittersweet by the story you have shared behind it. Your post is lovely and the story brought tears to my eyes. A very tender tribute to kissing.